Hastings Lake Gardens is located just 20 minutes outside of the city of Edmonton. It is one of our favourite venues to work at because the setting is magical. The property is owned by Terry and Dot Ziegler and they are the other reason we love this place so much. Both Terry and Dot are always so fantastic to work with and we know as soon as the couple arrives for their ceremony that they are in good hands. Hastings Lake has a few options for your ceremony. If you want an outdoor ceremony inside an incredible gazebo than this is your place. The gardens are beautiful from May to October. The other reason this place is so amazing is that it is also a greenhouse. So any flower or shrub that you can think of, they have it here. If the weather is not cooperating on the day of your wedding they also have options to have your ceremony inside the greenhouse or in the church at the back of the property. 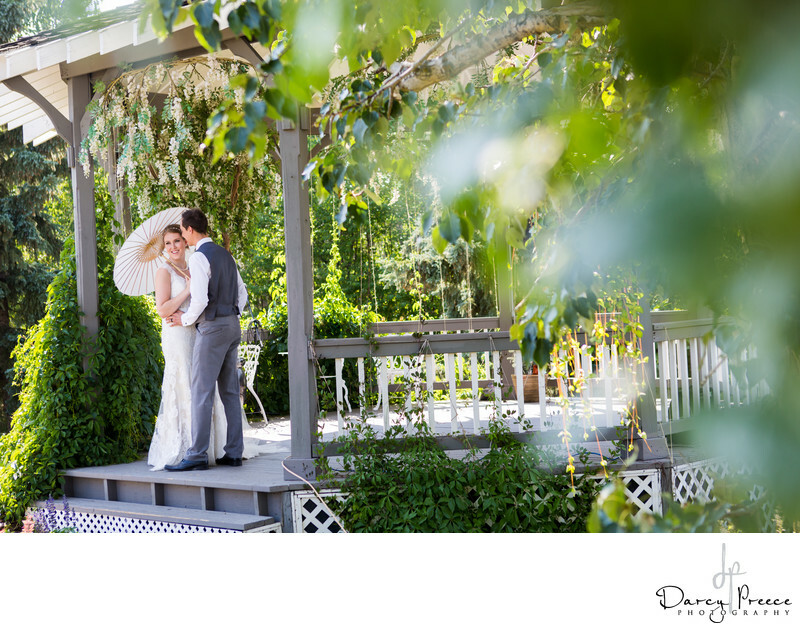 For us when we photograph a wedding at Hastings Lake Gardens we know that we will have unlimited options for places to capture your wedding portraits. There is a cement wall near the gazebo that is perfect for afternoon portraits because it provides some nice shade when the sun is out. They also have some gorgeous flowers around the wall to create a nice pop of colour. Our favourite spot is the gazebo! There are multiple angles that we can capture the perfect image while you are nice and cozy inside. The flowers and trees make for a perfect shoot through portrait. After those locations we like to head to the back of the property where they have the church and the coolest swing you will ever see. The church has vintage couches that are available to be brought outside to create magic. This is where the help of a couple strong groomsmen come in handy. The contrast of the couch in the grass is always a popular image. The church also provides multiple angles to keep you in the shade as much as possible. In the middle of summer the heat can really get to couples so we want to keep you as comfortable as possible. The swing is always a favourite when it comes to the bridal party. They also have an old tractor that the groomsmen always like to climb on. And just incase you are wondering yes it is an old massey ferguson. When it comes to venues there are not many like Hastings Lake Gardens. If you combine that with Dot and Terry you have the perfect place to get married. Location: 51056 Range Rd 204, Sherwood Park, AB T8G 1E5.